Do I Really Want to Be A Wife? ^^^^ I must say I am amused. While I can appreciate the gestures that these rules express..ummm…I just can’t imagine my day evolving only around my children and my husband. For those of you who didn’t click the link I’ll tell you the said rules of being a “good 1950’s housewife” lol. I’m not a cook. I’d like to learn. But…as of now? I’m not a cook. Ok. I almost agreed with this one. But the only reason for this rule was to be ready for his “return” Ummm..no. A house ain’t a house without noise! Lol, look. If we have children there is gonna be noise. Sorry. NOT. 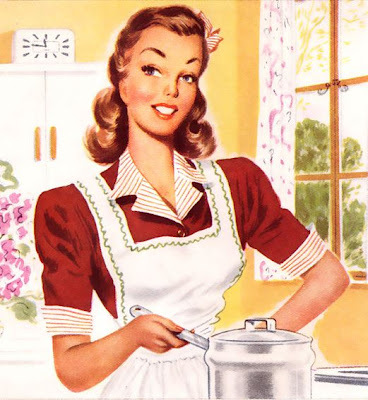 Sooo anyway, if I’m going to be a wife, I have got to be the revolutionized wife! I don’t have any rules, but here are my guidelines. Do way more than cook, clean, and tend to your children. Love your husband like you love yourself. Never sacrifice your dreams for his. Now, I’m a young 21 year old, so what do I know? Not much. But, I’ve learned that great joy comes from caring for others and not enough from caring for ourselves. Too many times wives are throwing themselves at the feet of their husbands, washing their clothes, cooking their food, raising their kids, all while letting their dreams fall to the side and making his come true. A revolutionized wife will not do that. I refuse. Most men wouldn’t do that for me, and I wouldn’t want them to. Women have got to take back the power. We can’t sit around expecting somebody to give it to us. No one is gonna do that.